When the final season of Breaking Bad was airing a few short months ago, Netflix launched a simple “Spoiler Foiler” designed to indiscriminately excise anything that mentioned the title of the show out of a user’s Twitter feed. Unspoiler takes the Spoiler Foiler to a more customized level. The browser add-on allows Chrome users to flag specific keywords and keep themselves safe from spoilers until they make it through any episodes waiting on the DVR. 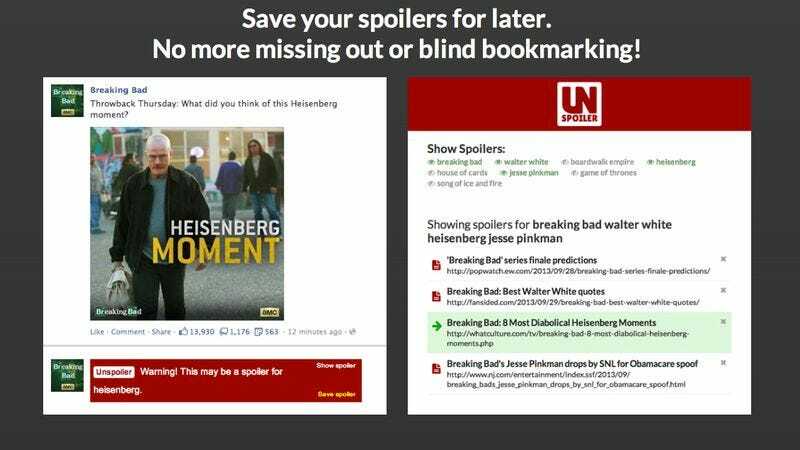 Unspoiler works across any and all sites, covering up any potential spoilers with giant red boxes on Facebook, Twitter, or any other standard webpage. And it’s easy to toggle between blocking something and uncovering a post that may have accidentally gotten caught in the overeager blocking algorithm. For now the add-on is only for Google Chrome users, but for those looking to keep spoilers at bay in a manageable fashion, this is now the go-to application.